With Thanksgiving behind us, it’s time to snap out of that tryptophan trance, put away the stretch pants and officially welcome the holiday season. Break out the twinkle lights, whip up a batch of your booziest eggnog and don your ugliest Christmas sweater because some of Nashville’s bars are decking the halls from top to bottom. One of East Nashville’s favorite local watering holes has transformed into a magical Winter Waldenland for the holidays. Complete with nostalgic holiday decor, dancing Santas, and life-size teddy bears, Walden Bar will keep you merry and bright. Guests will enjoy a Christmas Vacation-themed cocktail menu that will have you singing Mele Kalikimaka by the end of the evening. The fun doesn’t stop there! Walden will be hosting a series of events throughout the month of December to keep everyone in the holiday spirit. Winter Waldenland runs through December 31. And Why Is The Carpet Wet Toddddd? Tariff: Cocktails range between $6.00- $10.00. If you’re in the mood for a holiday jello shot, those are $3.00. Can’t-Miss: I loved all the cocktails, but the standouts were the Jelly Of the Month Club Jello Shot and Why is the Carpet Wet Todd? You can’t go wrong with either. Known for its vintage arcade games, extensive beer list and a warning to all that enter that growing up is a trap, HQ Beercade has transformed into Reindeer Games, a holiday pop-up bar with over-the-top decorations, interactive installations and specialty holiday-inspired cocktails that will make you swoon. Reindeer Games will take over the space with a different event or installation every single day in December. Imagine a life-size Santa’s Sleigh and an interactive snow-globe for you and your three closest friends! This has Instagram photo op written all over it. In addition to specialty cocktails like the Pumpkin Spice Hot Toddy, Red Ryder Spiced Rosé and White Christmas Grasshopper, guests can also enjoy some of Santa’s favorites snacks. Reindeer Games menu includes Santa's Sliders, Charlie Brown’s Christmas Queso, and Rudolph's Reindeer Snacks. Reindeer Games is open Monday-Thursday from 4 p.m.-3 a.m. and Friday-Sunday from 12 p.m.- 3 a.m. Get ready for a truly unique Christmas experience. More information about Reindeer Games can be found here. Tariff: Cocktails range between $12.00-$14.00 with shared plates priced between $10.00-$12.00. Can’t-Miss: Given the chill in the air, I typically gravitate towards beverages that make me toasty and warm. I really enjoyed the Pumpkin Spice Toddy. Not only will it warm you up, but it’s served in the cutest Christmas mug! Looking to get even the grouchiest Grinch in the holiday spirit? Look no further than Miracle at Hidden Bar. 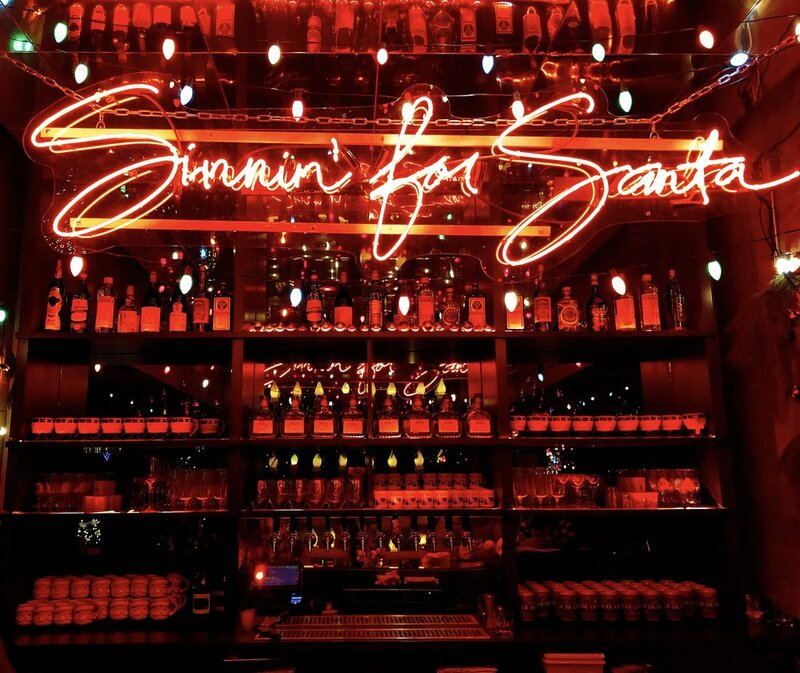 Miracle, a nation-wide Christmas pop-up bar, is bringing it kitschy holiday decor and festive cocktails to Noelle Hotel’s Hidden Bar. Guests can enjoy cocktails poured in themed mugs and glassware like Mrs. Claus and Cookie for Santa all while enjoying themed bites like Midwestern Sushi, Swedish Reindeer Meatballs, and much more. Forget that office holiday party and hightail it to this hidden holiday wonderland at Noelle where the spirit of Christmas is really brought to life. This holiday cocktail lounge runs through December 31. Had To Give This Big Guy A Hug! Can’t-Miss: If you are looking for that show-stopping cocktail, I’d recommend Mrs. Claus. Not only will it warm you up, but it’s quite the production.